Cotton and spandex. Rise: 11". Leg Opening: 11.5". Waist Flat 17.5", Inseam 29", Rise 10". Cotton/rayon/polyester/spandex. Wash cold; dry low. They call this light wash girlfriend. They really are pretty. I will answer within 24 hours. I do have a wonderful rescue dog. I’m an honest and fair person but I’m only human and I do miss things. Zipper fly. 98% cotton 2% spandex. Machine wash. FABRIC & CARE. Source of Wisdom by TORRID Stretch Jeans, Dark Wash, Flare Leg, Size 30. Waist measures 50”, rise 12”, and inseam 28”. Jeans are in excellent condition. This pair of capris is used and in GREAT condition, NO STAINS OR HOLES. 98% Cotton 2% Spandex. Torrid Demin Black Distressed Size 16R . Condition is Pre-owned. Shipped with USPS Priority Mail Flat Rate Envelope. NWOT Torrid 20 JEANS Boyfriend Cropped Capri Size 20 Ankle Medium Wash Fray Hem. Shipped with USPS Priority Mail. 26" Inseam. Plum/Purple Color. Stretch Cotton Blend. Torrid Denim Luxe Skinny Jeans 20S Women’s Plus Size 20. Condition is Pre-owned. Shipped with USPS Priority Mail. 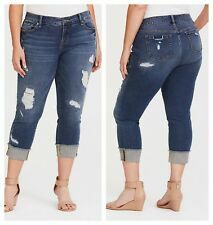 Torrid Denim Capri Jeans. glitter cuffs on hems. very good used condition! see pics for material. Torrid Denim Capri Jeans. factory distressed. super cute! inseam is 24 in. very good used condition! see pics for material. Skinny Leg. -Ankle Length. -High Rise. Front Rise: 11". Waist: 21". Torrid Jeans. 79% Cotton 19% Polyester 2% Spandex. Inseam 26". Darker Wash. Leg Opening 7 1/4". STYLE~Skinny ankle crop, mid rise waist, stretch. 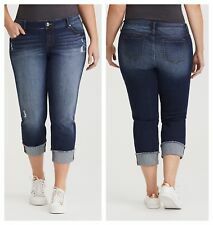 COLOR ~Dark blue wash.
Torrid’s Source Of Wisdom Dark Wash Bootcut Jeans Plus Size 16. Condition is Pre-owned. Shipped with USPS Priority Mail. Torrid Faded Blue Skinny Lean Jean Jegging 52% cotton 32% rayon 15% poly 1% spandex Waist: 20” Inseam: 27.5” Size: 2 R (XXL) Very good condition. A few things: 1. I only accept PayPal. 2. Please message me with any questions. 3. No one in our house smokes, including our two dumb dogs. 4. Kindly work with me before either of us says any mean things. Torrid Gray/faded Jeggings Size 14T. Condition is preowned, great condition. Super soft and stretchy. Style: Skinny. Color: Coral. Type: Jeans. Woman plus jeans size 26, excellent. It is light blue wash, inseam 30", length 40.2", waist total 48.5", front rise 12", back rise 20.5", 100%. Bright white again. I go over everything. pet friendly house = everything is clean & lint rolled. 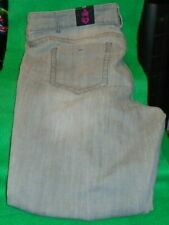 Women's 16 reg TORRID stretch jeans: Condition is Pre-owned. 1 pair of women's Torrid stretch jeans. Size 16 reg. Inside tag says they're 98% cotton 2% spandex, made in Vietnam. Skinny- “we swear by the fit” these are a medium/darker blue wash with lighter whisker marks and fade marks. Button zip waist, 5 pocket style. super cute and flattering pair of jeans!! I measured these myself with a tape, and the waist on one side without stretching it was 19 1/2 inches rise is 10 inches inseam is 32 inches 98% cotton 2% spandex Shipped with USPS Priority Mail. Skinny Leg. 39" Waist 30" Inseam 11.5" Rise. May be lighter or darker than actual Picture. Item is in great condition unless noted. Front Rise- about 11". Inseam- 32". Size: 14 XT. Length: 30". This sale is for a Torrid size 26 jeans. These are the stretch fit jeans. The jeans are used, no serious signs of wear. 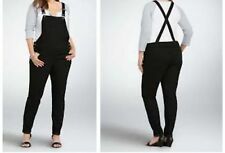 Torrid Plus Size 28 Capri Stretch Jeans Cropped Pant Size 28 ~nice! Torrid Denim Capri Jeans. waist - 26 in across. small note. it still buttons just fine. just wanted that noted! other than that no flaws. just normal preowned condition! inseam is 25 in. Size 20.20W. 75% Cotton, 22% Polyester, 3% Spandex. Plus Size Torrid Jeans. Size 22R, 22 Regular. 65% cotton, 26% rayon, 7% polyester, 2% spandex. Good Condition. Nice jeans! Material content: 65% cotton, 26% rayon, 7% polyester, 2% elastan. Rise: 11 1/2". Leg Opening: 5 1/2" laying flat. Inseam: 25". Torrid Jeans Embroidered Birds Distressed 16 NWT. Condition is New with tags. Shipped with USPS Priority Mail Padded Flat Rate Envelope. NWT TORRID JEGGINGS ROSE DENIM Plus Size 24 Tall. Condition is New with tags. Shipped with USPS Priority Mail. Never worn! Torrid 20 distressed frayed hem skinny jeans. Skinny jeans that hit at or above ankle depending on height. Distress with frayed raw hems. Nene worn. Torrid Ex Boyfriend Jeans Size 18R Ripped Distressed Stretch Medium Wash Denim. Condition is Pre-owned. Shipped with USPS Priority Mail Flat Rate Envelope. 2% Spandex. 19% Polyester. 79% Cotton. Torrid Women’s Skinny Jeans Size 18XT Medium Wash -Hidden Desert. Condition is New with tags. Shipped with USPS Priority Mail. This denim pant is very good condition. Leg opening. Top to Bottom Length. 98% Cotton,2% spandax. RISE: 11". LEG OPENING:5.5 ". 0X1X2X3X4X5X10X14W16W18W20W22W24W26W28W30W34W32 in.38 in.40 in.42 in.